As more schools move from interactive whiteboards to wall-mounted televisions or interactive panels, and from teaching in front of the roam to roaming the classroom, a simple screen mirroring and robust video streaming device is needed. This device needs to work with all platforms -- Windows, Mac, iOS, Chrome OS, Android, Linux DEB, and Linux RPM -- and be easy to use. It would be useful if it also included an administrative component to allow IT departments to manage the users and collect data on usage. There is already a solution designed specifically for education called Vivi (http://www.vivi.io) that does all of this and more! I was sent one by the company to try out. I cannot speak to the administrative portal and central management components of the device at length since I do not have a school network to experiment with. However, I did have to use the admin panel to set myself up as a teacher user. You can find out more about the administrative portal here, view all the technical details here, and the company will gladly set up a demo to both showcase the Vivi's capabilities as well as answer any questions you might have! The goal of the Vivi is to support real-time communication and collaboration in the classroom. The teacher is free to move about the classroom and mirror to the television or interactive panel. The teacher can give a student (or all students) control of the Vivi to share and showcase information with the entire class, too. Students can digitally "raise" their hand to ask for control from the Vivi app on their device as seen below. It does not matter what device they are using. This is a great feature for BYOD or 1:1 initiatives! The teacher is easily able to grant control by clicking on the student's name from the Vivi app on the their device. Instead of worrying about a student in a nearby classroom requesting access to share their device's screen, you can put a 4-digit Room Code on your Vivi that your students need to type in to access the device. Also, once you have Room Code on your Vivi, you can give open access for your students to share their screens. Now, as with any code, you have to insist your students do not share the code with others. However, if you teach multiple classes, you probably will want to change the code regularly! There are three ways teachers can show a video using Vivi. The first method allows the you to copy an online video's URL from the Web and paste it into your Vivi app. The video will play through the Vivi and the your teacher computer is free for other tasks, such as gathering additional information to share with students, monitoring a student chat about the video being shown, etc. View a training video about this feature here. The second method is for the you to play a video directly from your own device, rather than from the Internet. This is done by simply navigating to the video on your device through the Vivi app, and clicking play! You will still have access to their computer screen for other tasks with this method. The third method is called "Movie Mode" by Vivi. This option screen mirrors the video from your computer. When choosing Movie Movie mode as an option, there is a very short delay before the video begins to stream to allow for some buffering ahead of time so the video will play smoothly. To see more in-depth overviews of showing videos., check out this training video from Vivi. If you are is mirroring your screen, and need to gather some additional resources for students, you can freeze a piece of content, like a Problem of the Day or a paragraph to read. While the content is "frozen", you are free to use your computer for gathering additional items of interest for students, opening a different app to showcase something else, etc. To learn more about the pause feature in Vivi, check out this video! The capturing and annotation component of Vivi is very cool! First, you can mirror a piece of content from your computer screen via the Vivi app -- say projecting an unlabeled image of the parts of a flower or pausing a video you are currently showing. 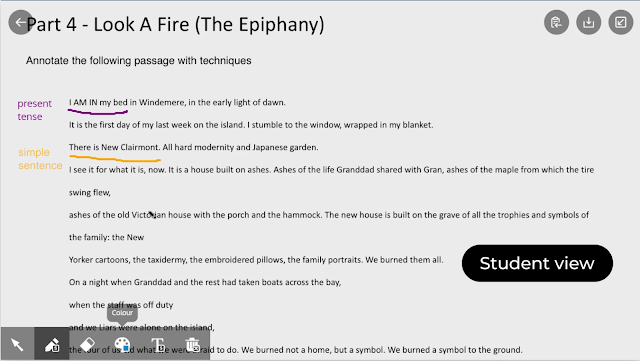 Students can then capture the image/video screenshot, use their Vivi app to pick the annotation tool and annotate their own personal version of the image or video screen capture. There are three choices to pick from when providing students with an image to annotate -- what is showing on their screen, an image from your device's photos, or a blank whiteboard students can create on. Below is a sample of the student view of the annotation tools. Student annotating an image captured with the Vivi annotation tool. When students are done with their annotations, they can either download the annotated image to their device and submit it to you, or copy it and paste it into another document, like a shared Google Slide or another document of their own. To see this feature in action, view this training video! There are three choices to pick from when providing students with an image to annotate -- what is showing on the screen, an image from your device's photos, or a blank whiteboard students can create on. I wanted to put the Vivi through its paces, so I set up my Mac laptop as the "teacher device" and my iPad as the "student device". 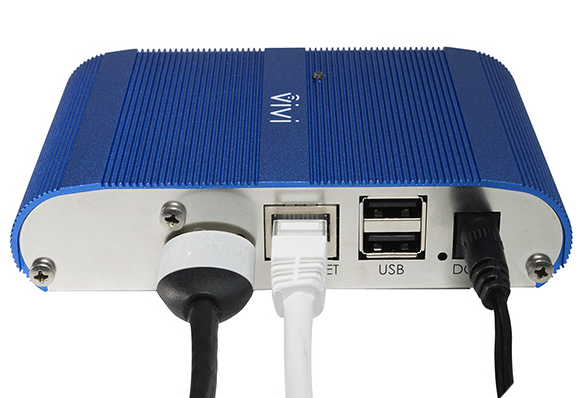 I attached the Vivi via HDMI to a television and via Ethernet to my Internet connection. I printed out this useful PDF with a labeled overview of the features of the teacher dashboard in the Vivi app that provides a simple explanation of each of the teacher tools. I logged in as a student in the app with no problem, but needed a presenter code (which would be supplied by your IT department) to log in as a teacher on my laptop, so I knew I had to open the admin portal. The company had set me up as an admin, so I opened the admin portal from my computer and had to put in a change of PW to create my own so I could log-in. The default options in the portal were already turned on, such as allowing me to direct-play videos, share links in the app, etc. I then plugged in the Vivi and it took a minute to show up on the television screen because it was setting up, but was ready to go in no time. I went back to the admin portal and noticed the Vivi I had plugged in was now showing up as a room, and, as an admin, I could change the splash image, manage the locations of the boxes, push out an emergency broadcast, and a ton more customization options. Everything seemed quite straightforward and the user guides included were very detailed if I needed help, but I really did not! On my "teacher device", I tried out all the features of screen mirroring, the different options to play videos, to supply the students with a static image to annotate, and pausing the mirroring. I found a feature I had missed, which was the ability to share a URL with all the students. The shared URL showed up in their Vivi app, and they just clicked on it! I then turned to my "student device" and requested control access, and went through all those options available to students. One thing I learned -- if your students are using iPads -- is to have students turn on AirPlay and pick the classroom Vivi to mirror to. 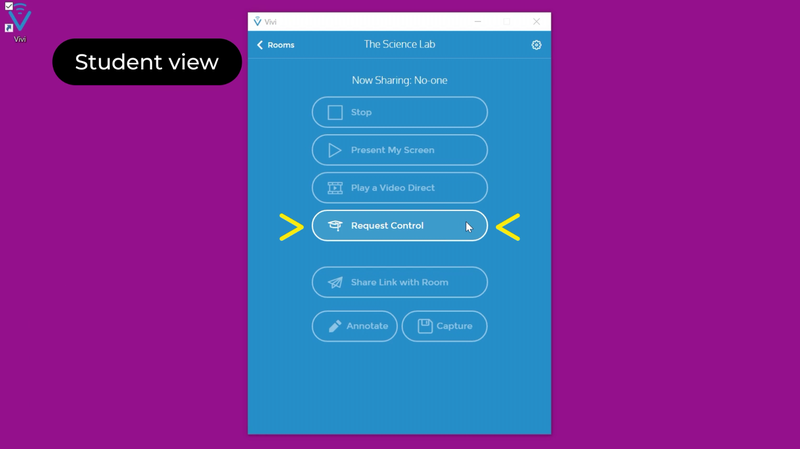 Another option I appreciated finding was, when a student has control and is sharing a video through their Vivi app, you can pause their video from YOUR teacher Vivi app if necessary. Just in case you want to discuss something...or something not quite right is on the screen! The set-up and administration of the Vivi was straightforward, and the classroom use by teachers and students was simple. The mirroring from the devices was instantaneous, the streaming did not hiccup at all, and the pass-off of control from teacher to student was very easy! If you are moving to televisions or wall-mounted displays in your classroom, take a look at the Vivi to allow freedom for you from the front of the room and the ability of students to share with others from anywhere in the room. Vivi is a winner!